Even Harvard has bowed to the Biotech Giants, stating that herbicide use is “ubiquitous” and may or may not increase with the cultivation of genetically modified (GM) crops. However, GM crops accounted for 45.2% of the global glyphosate market in 2012 and have been increasingly cultivated. Without GMOs, there would be a great decrease in the use of carcinogenic glyphosate. The biotech industry says that GM crops reduce the use of pesticides worldwide. This claim is blown out of the water by a new report using global glyphosate market research. The report exposes the link between increased GM crop cultivation and increased use of glyphosate-based products, like Monsanto’s Roundup. The organophosphate glyphosate is one of the most widely used weed killers on the market today. It was patented specifically to be used with Roundup-ready (glyphosate-resistant) GM crops. Since its introduction in 1974, sales have skyrocketed. In the past few years, however, countries have begun to consider banning glyphosate due to increasing knowledge of its effects, and others have taken even more solid action against the herbicide chemical. The WHO’s IARC cancer research arm calls the chemical ‘probably carcinogenic,’ and additional reports from the EU confirm the herbicide’s toxicity. These possible bans on glyphosate as well as new regulations on the use of GM crops could somewhat limit the overall growth of the herbicide’s market. TMR’s report, however, notes that the growing adoption of GM crops, especially in developing countries, is one of the major factors that drives the global glyphosate market. 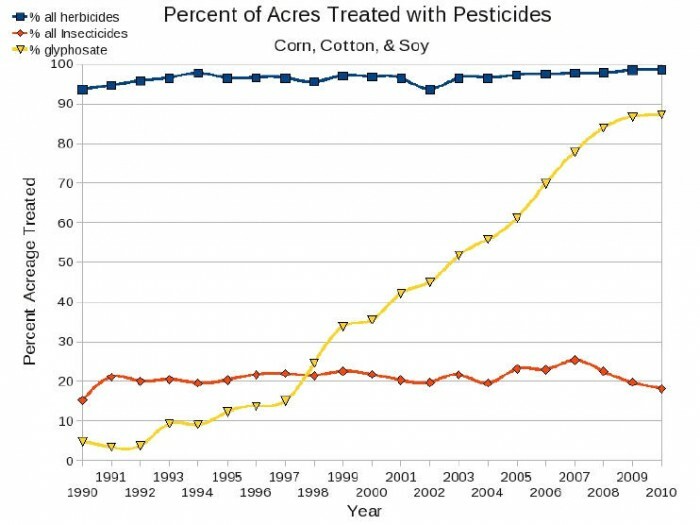 Cultivation of GM crops such as soybean, rapeseed, maize, and cotton is expected to increase the demand for glyphosate. The report also divides the glyphosate market into segments: North America, Asia Pacific, Europe, and Rest of the World. The glyphosate market is expected to grow largest over the forecast period in economies in China and Asia Pacific. Key vendors of glyphosate named in the report include: E. I. du Pont de Nemours and Company, Monsanto Company, Nufarm Ltd., Syngenta AG, Dow AgroSciences LLC, and Nantong Jiangshan Agrochemical & Chemicals Co., Ltd.